Day 8 of the 25 Days of Giving brings us the Cedar from Brentwood Home! This mattress is 100% natural, constructed with a flurry of organic cotton, latex, and springs. Not only is the Brentwood Home Cedar natural, but it’s insanely comfortable, and made out of Brentwood Home’s own factory in Southern California. Winner chooses the size on this fantastic mattress, so scroll down and enter! 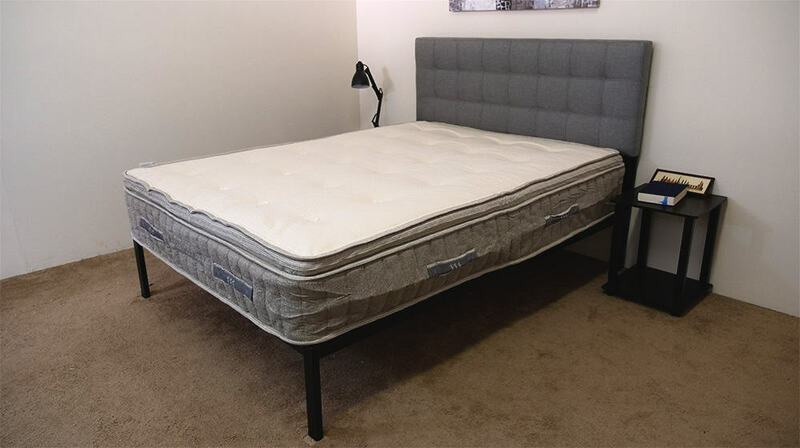 I’d suggest you check out my Brentwood Home Cedar mattress review for the full details, but if I were to name the most prominent aspect of the mattress, it would be its construction. Check out a pic of the inside below in its all-natural beauty. Make sure to visit Brentwood Home to learn more about the Cedar mattress, and go ahead and enter more mattress giveaways on our 25 Days of Giving page! I love that it utilizes natural materials to create an organic sleep environment. i love how its stable! What do I love about the Brentwood Home Cedar!? I love how the interior of the mattress is designed; all the layers from top to bottom. Never seen a mattress with these materials before; very cool. This is a great looking mattress! I like that is uses organic materials. This looks wonderful, especially the support for sitting on the edges. A lot of other mattress seem to ‘throw you off’ the bed when you sit on the edge. Such an ugly mattress. Sorry I cannot even get past that. I would not even sit on a ugly mattress to give it a try out. This sounds amazing! I love that it is 100% natural. Looks like shear luxury! Oh! I could dream the night away! Thank you so much ! I like the fact that Brentwood Home Cedar is 100% natural, constructed with a flurry of organic cotton. The pin point pressure mapping. The fact that it has no springs is great !! You may have just changed my mind on my next mattress. I was planning on the Avacado, but I rather like this one better. As soon as I read this mattress described as “insanely comfortable”, I knew this was the one my husband & I needed. Love the name too as I live near Brentwood, Tennessee. Yes, there is a Brentwood in TN and it is as beautiful as this mattress. My husband & I have been married for 27 years and our mattress is 15 years old. Do you think it’s time for a new one? Our backs say YES, YES, YES! Sleepopolis, we need a little Christmas right this very minute & we definitely need a new mattress. Thanks & happy holidays! Good luck everyone! This mattress Cedar from Brentwood Home looks like it is well constructed. 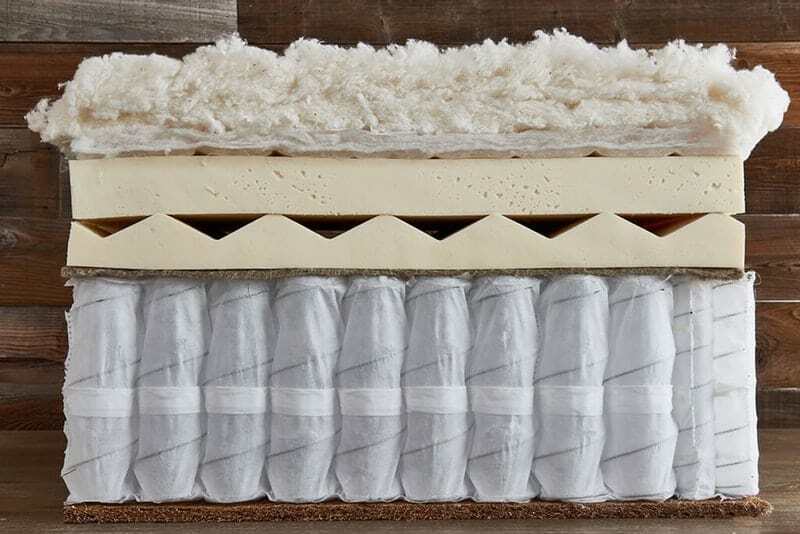 This mattress is 100% natural, constructed with a flurry of organic cotton, latex, and springs. Not only is the Brentwood Home Cedar natural, but it looks very comfortable. I need a new mattress and I would love to win this one, so this could be my mattress to get the best sleep every night. Love it’s durable & quality products!! I love the quality craftsmanship and the comfort of all the layers. I really love that it’s made with organic materials! I like the hybrid feature the most. I have a foam mattress and am disappointed with the support. I have been searching for an organic mattress & the design of the Brentwood Home Cedar is very promising! I’ve never thought about a mattress being organic. Excellent idea and you can teach this ‘old dog’ (lol) new tricks! I like that it is all natural and organic. A good mattress for keeping toxins out of the home. Thanks! organic mattresses are the only ones I will buy. I am allergic to everything, so this is a necessity in my house. I would love 2 full sized mattresses. One for my husband and me and one for my 92 yr. old mama. We really need two. Thanks for the great giveaway! This looks like a great mattress and what a great giveaway! I like the use of coconut husks as base. I love that they offer a 25year warranty!! I want to win. My old mattress and boxspring are worn out. I learned the Cedar consists of 2 inches of latex foam and also has cooling properties which would be very nice for me! Love that this mattress is made with organic material and eco friendly! Definitely enjoy the reviews. All natural is great! Thank you Shana, good luck! Lot’s of great helpful information in this blog… thanks!! I love that it’s all natural! Sounds like it will be super comfortable! WOW! This mattress is very well constructed! Love the coils and the support they give especially when sitting on the edge. I just love the organic cotton!